Some paths to joyful foot-launch hang gliding for you might depend on your physical fitness as to running and coordination. Athletic experience and present fitness? Then consider wings settled for tandem, but dedicated to just you. Study the topic "Safe-Splat" for some other parameters. What's the cheapest, safest, best, etc. way for me to get safely airborne in Wisconsin? But maybe the desire to fly would give you the incentive to lose 100 pounds. Don't even think about it at 300. ... or a tandem glider. I'm over 200 lbs myself and I've flown tandem with a number of instructors who were all over 100lbs (I think Malcolm was the heaviest ... close to my own weight). In other words, a tandem glider can carry at least 400lbs, so 300 should be no problem. JoeF wrote: Some paths to joyful foot-launch hang gliding for you might depend on your physical fitness as to running and coordination. Joe's comments on fitness are important in hang gliding, and I agree with his suggestion of a tandem glider. I think the bigger problem, however, will be finding good instruction in your area. I did a quick search of the US Hawks for "Wisconson" and I was pleasantly surprised to find 3 pages of results. I even found one reference to "Wisconsin" on page 8 of this very topic. But I'm not sure how many of them are active, so you might do that search and start from there. Also, as much as it pains me to say this, you should probably make a post to hanggliding.org or ozreport.com. If you've read through our forum, you'll find that the operators of those two sites have done some very bad things. But that doesn't mean that everyone on those sites are "bad". There are a lot of good pilots who post there, and you'll get a wider range of ideas and suggestions than you'll find here. As with everything in life, you'll have to use the experience in your own life to help you filter the responses. Don't be afraid to challenge anyone. Feel free to question any advice and post conflicting opinions to help you get to the truth in any matter. Robert Hutchinson wrote: During my registration process here, I had the opportunity to speak to Bob, who (to very loosely paraphrase him) pointed out that my plan might allow me to fly, it might not allow me to fly for very long...or ever again (yeep)! It was good talking with you! As I said on the phone, hang gliding can be dangerous. It is aviation, and all aviation has its dangers. History is littered with the deaths of those who ventured into aviation without sufficient preparation. So be cautious and seek out competent people to help you along the way. In the end, I hope you'll find it to be one of the greatest adventures in your lifetime. It has been for me. ... Welcome to the US Hawks!! Sorry Bob, outside of fooling around on the sand dunes, I've got to disagree. Hang gliding is a moderately athletic sport. You need to be able to run to take off and land. If not, you're inviting injury. And as I've said before, one should be able to pull one's self up onto the bar in an emergency. If very heavy people were destined to be hang glider pilots, I probably would have seen one by now. Robert would do better getting a 3-axis pilot's license and transitioning to powered ultralights. Rick Masters wrote: Hang gliding is a moderately athletic sport. These are all very good points, and I'm glad you've voiced them for Robert to consider. Rick Masters wrote: If very heavy people were destined to be hang glider pilots, I probably would have seen one by now. I hope Robert will invite you to some of his lessons. Rick Masters wrote: Sorry Bob, outside of fooling around on the sand dunes, I've got to disagree. Aren't you glad to be on a forum where you can disagree ... without getting banned? Robert, Rick Masters is one of the legends in hang gliding, and you should consider his comments carefully. Hang gliding does have aspects that make it physically demanding, and you should consider that carefully. That's something that you should discuss with any instructor when you schedule your first lesson. Rick, it's an honor to have you on the forum. Thanks for your extremely valuable comments. Please never stop giving them. Well, that sounds a little discouraging, since I haven't weighed 200 lbs since I was maybe 14? MCRD was able to get me down to 215, but I kept passing out; later, during my days as a professional Karateka (with only about 1% body fat) I was most productive at 225! Maybe that crane is an option...or a tandem rated kite! That being said, just how physically demanding is the sport? While I might still be able to pass the PFT (especially once my age of 52 years were factored in), I would certainly 'pay the price' for my efforts! This topic is mostly a "Hello" topic. Sometimes an initial "Hello" can turn into a longer discussion, but at some point it's good to start a new topic. This discussion seems to be of general interest, so I've started a new topic named "Hang Glider Pilot Weight". That might be a good place to discuss some of these important issues. I'll be quoting some of your posts there to kick things off, and I hope you'll continue the discussion there. P.S. I may have been underestimating the participation we have here at the US Hawks!! Bob suggested I say hello at this topic site. Name is Bill McGinnis, been training since Jan 2017 with John Heiney and have H2 rating. First flew in 1973 on a Manta standard Rogallo I bought in Oakland . . . broke the frame in a 1977 accident and then didn't fly for 40 years, partly because I left California for Switzerland and the East Coast. Live in San Diego now and have more time and I love hang gliding. Welcome to the US Hawks Bill!!! It's an honor to welcome you to the US Hawks. It may have been fortunate that you broke that Manta in 1977 because there were many dangerous years around then (before my time in the sport). John Heiney was my instructor as I was advancing toward my H4, and he's top notch in my book. Good choice. We've also been recently flying at Dockweiler in Los Angeles, and I go there about once a week (usually Mondays or Tuesdays). It's a very fun little training hill, and it's a great place to hone (or re-hone) some basic skills. It's also a lot of fun right there on the beach. Please let me know if you're ever interested in flying there and we can work out the details. 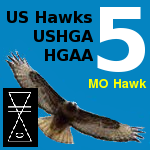 Mostly, welcome to the US Hawks, and we'd love to read about your history (from the olden days) and your progress as you get back into the sport. P.S. Here are a few photos from yesterday's flying at Dockweiler Beach. This first picture is Joe Faust (USHGA #5) launching the Condor. The site is often soarable (it was almost that good yesterday), but even without soaring, it's a fun place to fly.